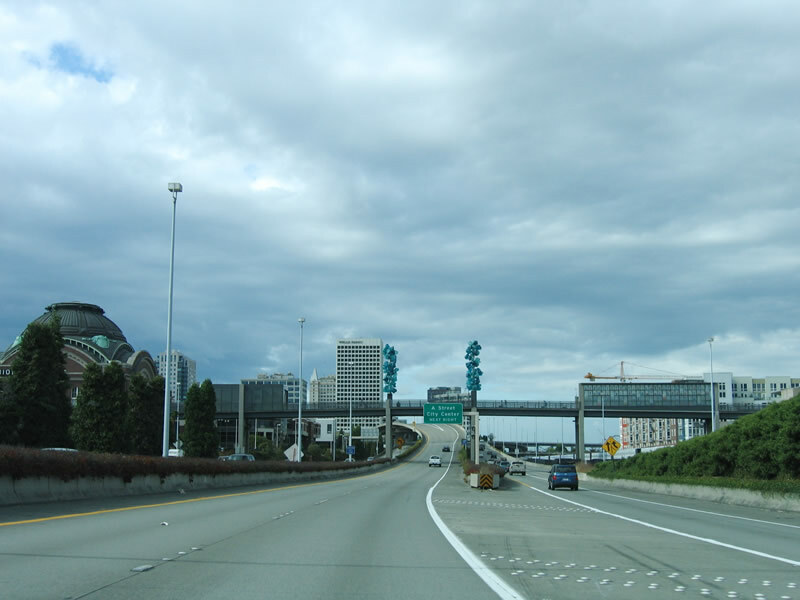 Interstate 705 is a short freeway spur connecting I-5 and Washington 7 with Downtown Tacoma. The WSDOT Interchange Viewer Diagram lists the route at 1.50 miles in length, with an official end at the 9th Street southbound on-ramp across from where Schuster Parkway begins northbound. Interchanges are unnumbered, but there are mileage markers for milepost 1. Washington 7 extends south from I-5/705 along a freeway to a partial interchange with East 38th Street. There were plans to extend the freeway south of East 38th Street, but such plans apparently lie dormant. The state route begins at U.S. 12 in Morton, winding its way northward near Storm King Mountain before descending upon Spanaway, Parkland and ultimately Tacoma. Northward view of Interstate 705 from the Bridge of Glass pedestrian overpass in Tacoma. Photo taken by Justin Cozart (03/27/05). Interstate 705 opened to traffic in 1991.2 Establishment of Interstate was conditionally approved by AASHTO on June 29, 1978. Interstate 705 crosses under the Chihuly Bridge of Glass. This a 500-foot-long pedestrian overpass offers a connection between downtown Tacoma and the Museum of Glass and the Thea Foss Waterway was built as part of the Interstate 705 project. Photo taken 08/29/06. A northbound Interstate 705 reassurance shield stands along side the A Street/City Center off-ramp beyond SR 509. I-705 closely parallels Thea Foss Waterway, which flows north into Commencement Bay. Photo taken 08/29/06. The freeway continues a short distance from below the Murray Morgan Bridge at 11th Street until it merges onto Schuster Parkway. Photo taken 08/29/06. I-705 officially ends ahead of this set of overheads for Shuster Parkway and Stadium Way. Schuster Parkway extends north and then west along Commencement Bay. It eventually splits into Ruston Way (en route to Ruston and the SR 163 ferry to Vashon Island) and 30th Street west across Tacoma. Schuster Parkway is an expressway alignment with limited intersections. Photo taken 08/29/06. Traffic on I-705 north diverges into two ramps: left for Schuster Parkway, right for Stadium Way. Stadium Way also travels north like Schuster Parkway, but while it initially parallels Schuster Parkway, Stadium Way offers local access to the waterfront neighborhoods. Photo taken 08/29/06. Schuster Parkway south shifts east onto the freeway leading south to Interstate 705 as Pacific Avenue separates toward Downtown Tacoma. Photo taken 08/29/06. A freeway entrance sign formally marks the transition of Shuster Parkway south, though I-705 does not officially begin for another 0.4 miles. The freeway initially partitions through a multiple deck structure, so that traffic can connect with Stadium Way. Photo taken 08/29/06. After merging with traffic from Stadium Way, southbound Interstate 705 enters a brief cut and cover tunnel segment. Fireman&apos;s Park sits on top of the structure, providing additional green space and views for Tacoma residents and visitors. Photo taken 08/29/06. The 9th Street on-ramp merges onto Shuster Parkway south, marking the start of Interstate 705. The freeway proceeds south under the Murray Morgan Bridge (11th Street) along the east side of the Tacoma city center. Photo taken 08/29/06. Heading south from the single point interchange with SR 509 (21st Street), I-705 approaches the exchange with Interstate 5. Photo taken 08/29/06. Southbound Interstate 705 comes to an end as the freeway separates into two lane ramps for I-5 south to Olympia and Portland and I-5 north to Seattle and Washington 7 south to Mount Rainier. Photo taken 08/29/06. Even though maps show the SR 7 freeway connection as a “through” route, motorists must follow the ramp for northbound Interstate 5 to make the connection to southbound SR 7. Photo taken 08/29/06. Continuing along the ramp, Interstate 5 and Washington 7 split. Washington 7 travels south from Tacoma to Mount Rainier while I-5 leads north through Seattle to Vancouver, British Columbia. Photo taken 08/29/06. The SR 7 freeway northbound commences from a partially built six-ramp parclo interchange with East 38th Street. A roadway stub appears along the loop ramp to SR 7 north from 38th Street east as the state route proceeds north a half mile to I-5/705. Photo taken 08/29/06. Winding north from East 38th Street, SR 7 approaches the systems interchange with Interstates 5 and 705 with four lanes of traffic. Photo taken 08/29/06. A lane drop occurs on SR 7 north for the ramp to northbound Interstate 5 for Seattle. The mainline advances north with two lanes to connect with I-5 south and I-705 north to the Tacoma city center. Photo taken 08/29/06. Washington 7 north ends and I-705 begins as the left exit for Interstate 5 south to Olympia and Portland, Oregan departs. Photo taken 08/29/06. Construction in 2006 expanded Interstate 5 leading north toward Exit 133 with I-705 and Washington 7. Further work on this stretch of freeway commenced in August 2014. The I-5 – M Street to Portland Avenue – HOV project completed in November 2018 widened I-5 to four general purpose lanes and one HOV-lane in each direction. Photo taken 08/29/06. Prior to the Yakima Avenue overpass, northbound Interstate 5 approaches Exit 133, Interstate 705 north to Downtown Tacoma and Washington 7 south to Mt. Rainier. Photo taken 08/29/06. Northbound Interstate 5 reaches Exit 133, Interstate 705 north and Washington 7 south. Photo taken 08/29/06. The right lane of I-5 south drops at Exit 133 for I-705 north and SR 7 south. Photo taken 08/29/06. Interstate 5 shifts southward along side Wiley Avenue and the Tacoma Dome on the approach to Exit 133 with I-705 / SR 7. Photo taken 08/29/06. Southbound Interstate 5 reaches Exit 133 for I-705 north to the Tacoma city center and the Washington 7 freeway spur south to East 38th Street and Pacific Avenue. Photo taken 08/29/06. 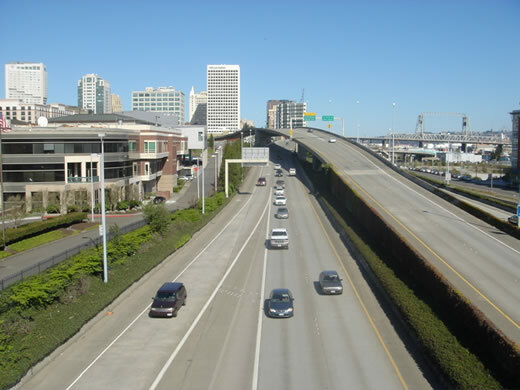 The systems interchange (Exit 133) joining I-5, I-705 and Washington 7 includes connectons with East 26th Street to the Tacoma Dome. Photo taken 08/29/06. “WA I-705.” online posting by ErmineNotyours, AARoads Forum, June 4, 2018. Interstate 705 (Washington) @ Wikipedia.org. Page updated July 4, 2018.